Valentine's crave for love and more to that, it seeks for the oddest expression of love. And to cater to this unique gift here's a perfect exuberance of heart-shaped arrangement of 35 red roses with half a Kg black forest cake all stuffed with sweetness and love. Order uniqueness with our love-rich combo today! 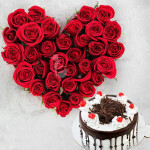 This combo comprises of: "- 35 red roses - 1/2 kg Black forest Cake"